Having a little one that suffers from eczema is not great. That's why it has taken me a while to write this post, one week is not enough, two weeks your sort of seeing results, but definitely by three to four weeks you will know if it is right for you and your baby. My poor little Cha-Chi wakes up a good 3 times if not more, literally tearing at her skin due to the irritation from her eczema. It is a full-time job, just making sure she is moisturised sufficiently throughout the day 24/7. It can be hard especially at nursery, but luckily they are super great and always happily apply. Now that the weather has changed it has gotten worse, this cold dry air just literally draws out the moisture in her skin, that's why I was super happy when Mustela reached out to us. 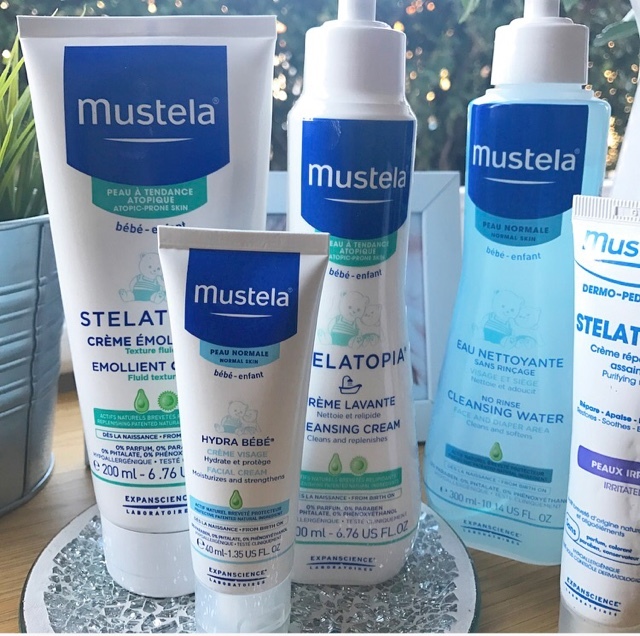 If I am honest, I had never heard of Mustela, but after doing a bit of research and then going to meet them at the Baby Show I prayed for a miracle that these products would actually work. Back home laden with Mustela products, which all came packed in a lovely gift box I was ready to give them a go. We were given a huge variety to try, but after going through our goodies are picked what best suited our needs, which were for bath time the Cleansing Cream and to moisturise after I went for the Emollient Cream. Both are dedicated to helping calm skin irritations and help reduce allergic reactions. The Cleansing Cream I used for to clean Leanora's skin, we normally don't use any products as in her bath I do but 3 cap fulls of Cetraben, which I find help nourishes and repairs her skin, so nothing else I fell is required other than just using her sponge to wash her down with. So this was a nice treat for her as once she was wet I rubbed in the cleansing cream all over her, gently rinsed off and patted her dry. I found that once dry her skin looked nourished and had a nice sheen to it and her skin felt soft and not sticky as I thought, due to the sheen. I finished off her bath time aftercare with the Emollient Cream, this for me I love applying to her skin, it smells exactly like marzipan, it is very light and glides on smoothly, the only downside for me is that it can feel a little sticky once applied but like the cleansing cream, it too leaves her skin looking nourished. Now before bed, I have three steps that I follow so that she has a well rested night, without the irritation. For me, this is the biggest thing that would determine if Mustela had a place in our lives. Like us adults, we always have a three or some more step at night, cleanse, tone and moisturise. This should also be the same for our littles ones. So prior to bed, I use the No Rinse Cleansing Water, similar functions to the Micellar water but this is for children. It helps to clean and remove all the dirt and grime from nursery and also to soothe her skin from the harsh cold weather. Once her face has dried I apply Mustela's Facial Cream, this is for normal skin types, just like the cleansing water but I think this works well for Leanora and dare I say it me too. Yes, i've tried the products too, just because it states that they are babies doesn't mean that it can't work for the whole family too. I've saved the best till last, this is the reason why this post has taken me so long to write, I wanted to make sure it worked and see if it didn't. I hate, well not hate, but why to do a post on such an important product/'s and not test them for a long enough period, a week is not good enough. L's eczema is the worst on the creases of the elbows, this is where most of her discomfort lies and keeps her up for most of the night, tearing at her skin, which as you can imagine is really hard to watch her go through. The Purifying Recovery Cream from the Stelatopia range is made for irritated skin, it is thicker than the other creams, which is what is needed to protect the barrier and restore the broken skin. I remember the first time I used this, I reached for it in the middle of the night, when she woke up in discomfort literally clown at her arms, and I applied only a small pea sized amount and rubbed into the affected areas, I noticed that she had instantly calmed, still a slight scratching but was relieved to see her drift back off to sleep, I thought wait, really, this can't be true maybe I am just tired as hell, but the same happened the next night and nights after that, after 8/9 days I had noticed, that her broken skin had started to heal, and the redness had reduced tenfold. Before I was using the Hydrocortisone and as you know that has sterilisers in, which is not good for your child's skin and can even end up changing their colour, so only resorted to using it sparingly. But I have to say truly, Mustela saved my daughter as well as me, don't get me wrong, some nights she still wakes, but guaranteed that's not if my three steps are not followed each night. No Rinse Cleansing Water, Facial Cream then her Purifying Cream. Overall, I have to say I am extremely pleased with the results, my Cha-Chis arms are on their way to a full recovery, not that her eczema will fully go away, but Mustela is here to stay and help keep it at bay. Have you tried the Mustela products, what are your thoughts? Plus did you know that they don't just cater for the little ones, they are spreading love to the Mumma's too from pregnancy to aftercare. Thank you Mustela, for helping and protecting Leanora's skin and helping out a sleep deprived Mumma. You can find Mustela range here to purchase.